Moon Township administrative offices are located at 1000 Beaver Grade Road, Coraopolis, PA 15108; phone: 412-262-5344. 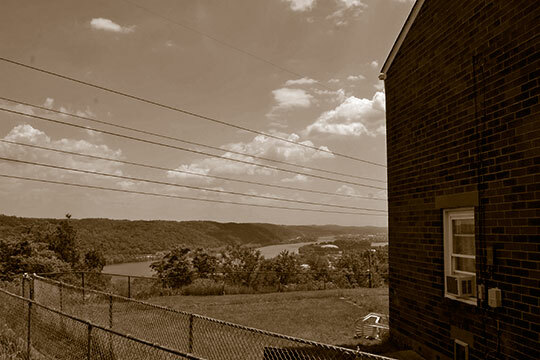 Photo: View of Ohio River from Hemlock Drive bluff, Mooncrest Historic District, Moon Township, PA. The Historic District was listed on the National Register of Historic Places in 2013. Photograph by Angelique Bamberg, 2013, for nomination document, Mooncrest Historic District, NR# 13000741, National Park Service, National Register of Historic Places, Washington, D.C. Moon Township is the oldest municipality in Allegheny County, establish ca. 1788. Moon's location emerged as strategic to the war effort as the United States mobilized for war in the early 1940s. The industrial infrastructure of Allegheny County converted rapidly to war production, and the massive build-up of the region's military capabilities created an acute need for civilian labor. In response, thousands of workers migrated to the area to take positions in the mills and factories. Moon Township's undeveloped acres were located in close proximity to busy steel mills in Aliquippa and Coraopolis and to the Dravo shipbuilding plant on Neville Island, making it a crucial location for war production. The provision of adequate nearby housing for defense-industry workers was considered essential to the war effort. The construction of the Mooncrest Workers Housing Development therefore supported the mobilization of United States industry for World War II. Angelique Bamberg, CLIO Consulting, Mooncrest Historic District, Allegheny County, PA, nomination document, 2013, National Park Service, National Register of Historic Places, Washington, D.C.